I am about to install a green “splash-back” glass wall in a commercial clients space! This 5m wall size panel will be used in a conference and training room to write and brainstorm with a white marker! I hope it works and looks spectacular. It’s not this bright (I have a darker green in mind) but I LOVE how this brings a outdoorsy freshness to this white kitchen. Two thumbs up. 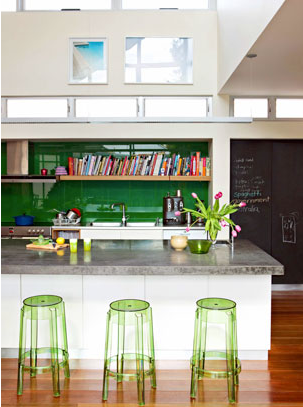 Lots of people are using coloured splash backs- “not a new new styling idea?”….. I concur. However are you using the other accessories around the space to highlight the colour. Got stools- match a tone or same colour in cushions. Got storage jars – pick a pattern with your base colour. Got a clock match the colours for ultimate repeat! Splash backs are not just for kitchens and bathrooms- think of high reflective coloured glass for halls, entrances, laundry and sunrooms. Did you know you can pick any colour you like!? PS if you are after a reputable supplier for your glass try Glass Direct Australia– the same company that worked on the block and very helpful to deal with! What is your favourite colour for a splash back?